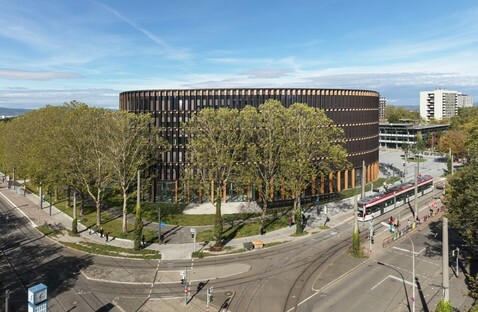 The city of Freiburg im Breisgau has set an important new record, for the city’s new administrative offices are located in the first public building in the world to produce more energy than it consumes. 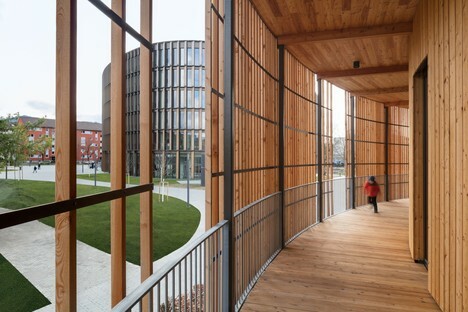 Freiburg Town Hall, designed by Ingenhoven Architects, opened one year ago and was discussed at the World Architecture Festival in Amsterdam November 28 through 30, 2018. 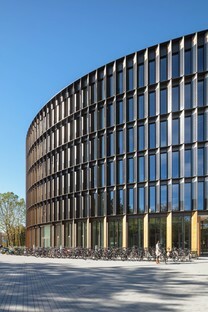 Freiburg is often cited as an example of a young, smart city. 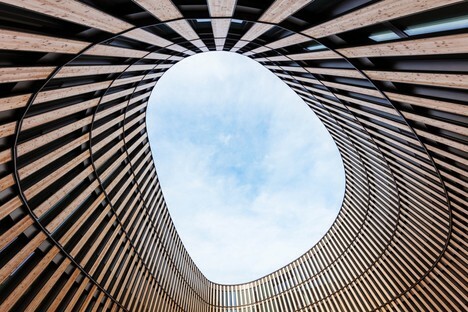 Surrounded by the luxuriant natural growth of the Black Forest, the city has always been a crossroads of different cultures due to its location in southern Germany, near the borders with France and Switzerland. 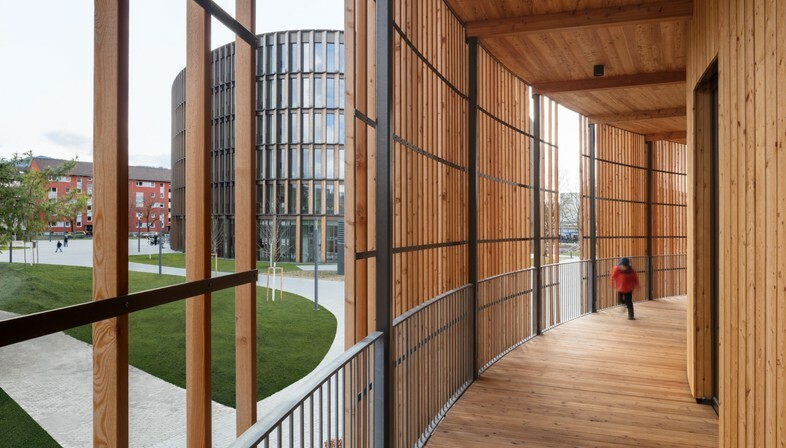 In the early 1900s Freiburg University became the first German university to accept female students, and students from all over the world study there every year, including many participating in European Erasmus projects. 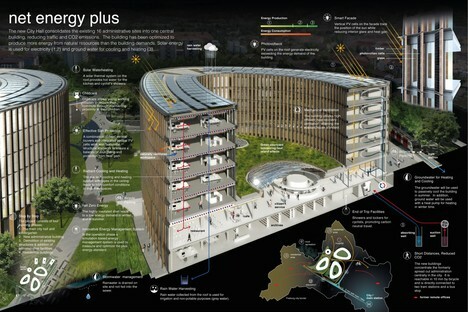 But in recent years the German city has made a name for itself by making the important choice of becoming a truly “green” city in terms of energy conservation and sustainability. 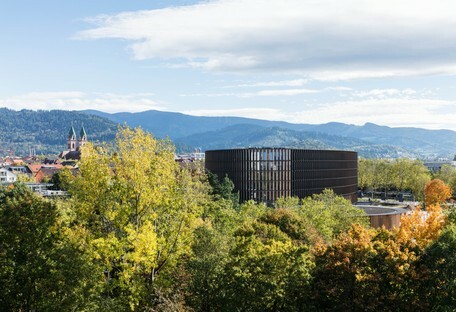 Freiburg is now considered the capital of clean energy for a number of reasons, including the large number of photovoltaic panels covering the roofs of its buildings, the presence in the city of important institutions promoting alternative energy sources, and its status as the first German city with a local energy plan. 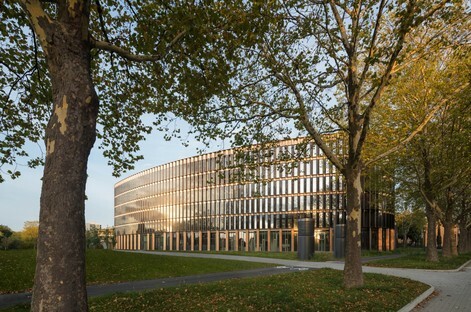 This long list of merits grew even longer a year ago with the completion of the Freiburg Town Hall, a new administrative centre designed by Ingenhoven Architects. 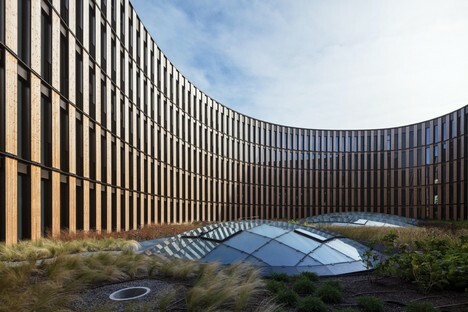 The new building designed by Ingenhoven Architects provides a workplace for more than 800 city employees who formerly worked in various different locations all over the city. 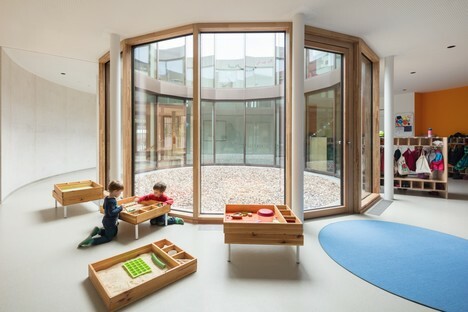 It and the adjacent daycare centre built on the basis of the same criteria are integrated into a large green area between Eschholz Park and the university hospital, served by a network of public pathways. 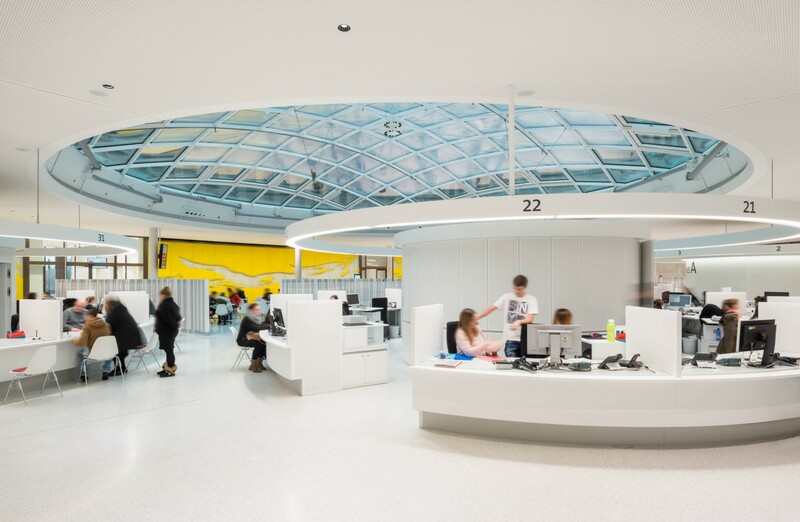 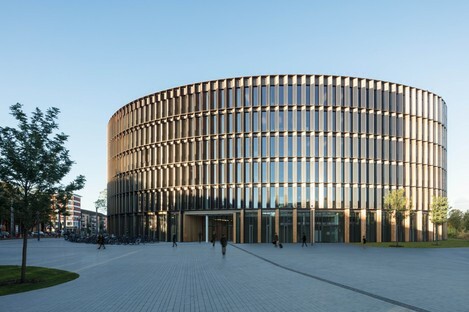 The new Town Hall designed by Ingenhoven Architects replaces a building constructed in the sixties, as part of a wider-ranging plan which, when completed in 2024, will provide the city with a series of other oval-shaped buildings containing a number of administrative functions. 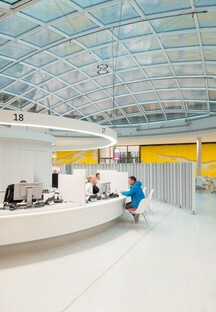 The new town hall is a six-storey building with citizens’ services, a conference hall and a cafeteria for employees on the first floor. 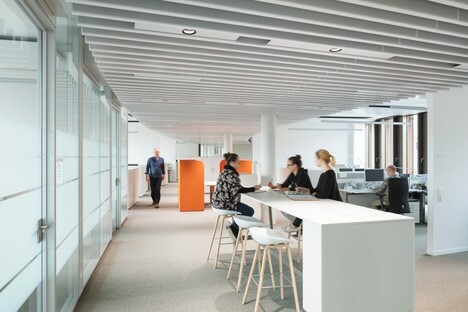 The upper levels contain office spaces which can be configured in different ways using a system of mobile glass dividing walls. 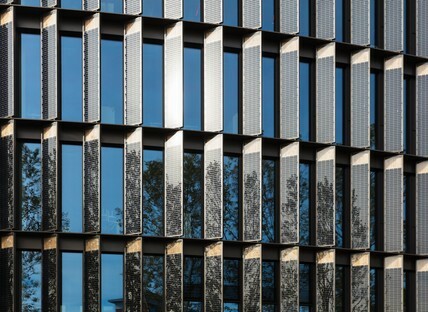 The façades of the two new buildings feature large timber elements and vertically staggered modules with built-in photovoltaic cells which, along with the roof modules containing photovoltaic cells and other systems, allow the building not only to achieve energy self-sufficiency but supply a surplus of energy to the public power grid.